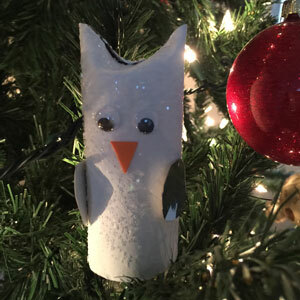 Make this cute Snowy Owl to decorate your Christmas tree. The sparkles on the owl will reflect your tree's lights beautifully. Make one or a whole bunch! These owls are fun and easy to make. googly eyes or black craft foam or black construction paper. Using your fingers press in the top of the toilet paper roll on both sides. Protect your crafting area by putting down newspaper or another protective covering. Paint the toilet paper roll white, while the paint is still wet sprinkle sparkles over the entire toilet paper roll. Allow to dry. Use glue to attach the googly eyes. If you prefer to use foam or construction paper for eyes, cut two circles for eyes and glue them on your owl(s). Cut a small triangular shape from orange crafting foam or construction paper. Glue into place just below and centered between the eyes. Cut two wings for your owl. We made ours in a big teardrop shape. We used some silver box board that we found in our crafting cupboard but construction paper or patterned scrap booking paper would work well too. Glue the wings into place. Allow the glue to dry on the eyes, nose and wings before placing the Snowy Owl(s) in your Christmas tree.